Discussion in 'WIP (Work in Progress)' started by VelvetFistIronGlove, Mar 30, 2008. 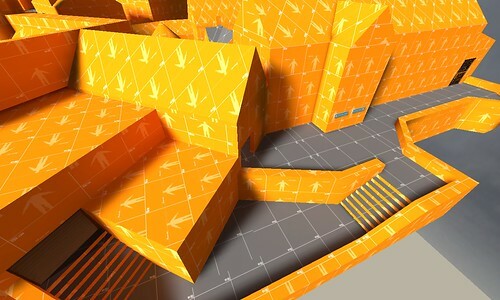 16 May 2008: The map has been updated: The current release is alpha 4b (7zip, 4MB). This fixes some serious bugs in a4. 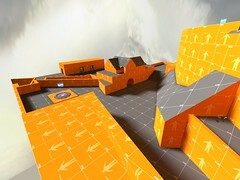 Here's pix from the alpha 1 release of my current map, cp_siege. 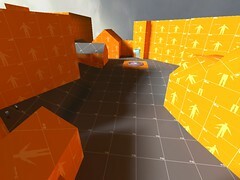 The map is a 3-stage attack/defend map, like dustbowl. Red is attacking, and Blu defending. From just beside the red (attacking) spawn. The drawbridge is on its way down as the round begins. You can just see CP 1 over the wall to the right, and a tiny bit of the moat to the left. CP1 is clearly visible, as is the (temporary) red spawn. On the way from CP1 to CP2 you've got to run the gauntlet along this narrow passageway. This is CP2, looking back toward CP1. You can see the other side of the portcullis gate here. Also visible are the placeholders for numerous cannons, and one large bombard up high. The three ways into CP3 are from this platform, or through the gate on the right or over the low roof in the distance. CP4, which is approached by red from this side from doors in the hut on the left or the building on the right, or through the alley at the distant left. The large barracks building behind the CP holds the blu spawn. 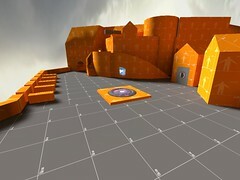 Blu spawns in the building with towers here, with one door leading into this square with CP5, and the other leading out to CP6 which can be seen in the background. CP6 is the half-moon battery in the distance, which overlooks the first stage of the map. When red captures this, then the castle is theirs. 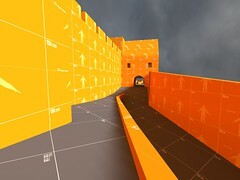 This image shows the exit to one of the tunnels, this exit needs to be made a lot more spacious, I don't know if the ground in this area will be a displacement or not but if it is one easy way to make this exit better would be to make that orange bit slope aswell as the path that already exists. The shadow entity is 'shadow_control' you just need to pick a colour that is suitable, a dark, desaturated blue usually works best, and set the angle to the same as the angle of the light_environment. On the lower battery there's a ramp where you can see the cap point on the other side but if you try to shoot them you hit a sky zone. Yeah, the skybox is quite high in most places. The verticality of the map requires it in general (getting on top of buildings, etc). There's one place I'm uncertain about (just before CP 5), but I'll wait and see how the game plays there a little more. Thanks. And everyone, what's with all the winks? For the alpha I'm only concerned that the doors are functional. Their looks are definitely going to change in most cases anyway. Yeah, so I found out. For the moment I've just moved the exit up to ground level, so I'll see how that plays on the game day. I've also toyed with the idea of making it exit on the other side of that building, just on the entrance to the "alley". Yeah, that's intentional right now. I need to decide how to make it more clearly partitioned off -- probably with a nice wrought iron fence model that sits atop the wall or something like that. Anyway, thanks for your comments and particularly for taking the time to give the map a go. Just from that time I can see some serious issues with layout that I want to address in the next couple of days. After a couple of quick playtests, I realised there were some rather major layout issues that were causing players to get needlessly lost. So I've addressed these in the cp_siege_alpha2 release. Known issues: There are some vis issues with bits of roofs appearing/disappearing. No cubemaps in the map, so the water & CP's have those lovely purple checkers. Some doors look odd or don't line up properly. Everything's ugly orange. Right now, I'm interested in feedback on the layout, flow, and how it plays; anything else in the alpha is probably temporary. 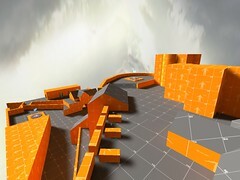 well layout seems a bit nicer now, not that it was bad before, everything just looks so 'samey' with orange textures. Still, some signs wouldn't go amiss, but you already knew that. forgot to mention it last time but you need to scale up your water texture, 0.5-0.75 should do it. I liked the height advantage that the much debated passage gave the defenders I think raising it to the level of that area is a little bit of an overcompensation imo. You already know your are geting some major vis problems due to skyboxes. Health an ammo is criminally sparse still, you didn't add any more did you? Still, some signs wouldn't go amiss, but you already knew that. There'll be signs in the beta at latest, but I thought that trying it without signs was a good acid test of how intuitive the layout was. And alpha 2 worked much better in that regard than alpha 1. Thanks for the tip about the water texture. I don't know. So far, it seems the defenders already have a strong advantage; I don't want the first CP to be uncappable. Not just you -- they seem to be very powerful in defending CP1 and the approach to CP2. I'll be keeping an eye on them to see if I need to tweak the layout to nerf them slightly. Great stuff. I had a play through with a few friends of mind. I love that it is a vertical map, and on cap 3 you can look down and see where you were. 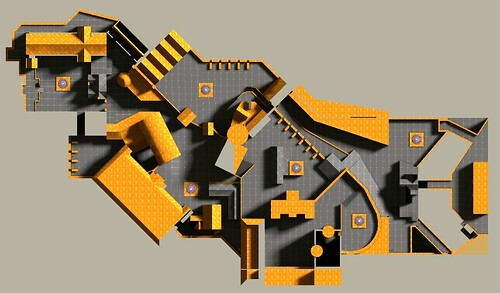 There are also so few Dustbowl style maps that this one really hits the spot. 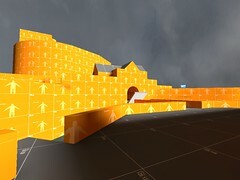 I've tried a few other "Castle" maps, and by far this is the one best laid out. I hope as far as style, you don't get to "fairy castle" with it like in the "Castle" map, and do it like the castle in Edinburgh which I have been to. Strong. Old. Tough. Stone. The cannons are a great touch. Also, are all of your cap points going to be "open" in this way? Think of the "guarded" high point in Badlands where you have a screen to block your back. So easy for snipers to take you out when you are sitting in the middle of a wide open place. Gravel Pit has all enclosed points, and Dustbowl has obstacles for snipers as well. Snipers should be able to snipe, but there ha to be interference when someone gets you a half-a-mile away. Also, one of the points is directly in front of a double doored spawn, which makes it too easy to spawn camp the defenders. You could do something like they do in Corporation and try to keep the spawn varied in direction, or put it off to the side with interfering walls. As an engy, you could help us out by putting in more metal close to obvious turret places. And 200 metal ones here and there. About the draw-bridge, could you make it wider? Both for dramatic reasons, and not allowing people to bunch too many stickies in one place. In Level 1, the sniper tower is a little ridiculous. Someone can snipe all the way to spawn from there, and there is no way to go and clean that room out. I love the drop down hole in the middle, but I would suggest you make it a perch instead of two small windows. You have to allow the sniper to be honest. And I can imagine just sitting in there as a demo and just spamming the hell out of that areas. The only real way to take care of them is get a spy in, but it's too complicated to get up there undetected. At least if you had it open, or open with a guard in the middle it would make it more honest. Anyway, just a few thoughts, and keep up the great work! Just a couple of more comments on the first and second stages. You can reach the point with a one sticky jump. I know you want to have the point visible from spawn as a visual cue, and there's no reason to put up and invisible wall, but it shouldn't be so easy to one sticky to the point right out of spawn. Either put the CP higher, or lower the spawn. Lowering the spawn could be cool as well as it would be more dramatic and look "uphill." like in the Halo 3 map High Ground. In fact, if you were looking for a subtitle for the idea of your map it's "uphill." The narrow road from CP1 to CP2 is great in this regard. I don't think people have really played with that idea in a Dustbowl style, so you have a great opportunity. As for Spawns, I hope you don't have us in a "box" spawn out of the gate. 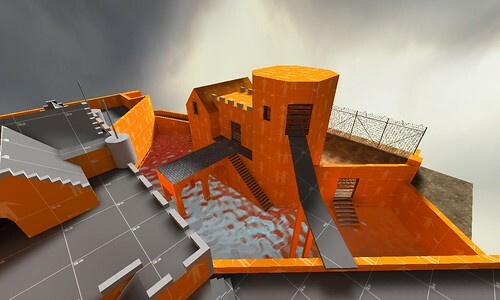 Are you going to allow people to "play" in the moat and other areas during setup time, and have the drawbridge be the actual door like in Dustbowl 2? It would be great, as it would allow people to see the map in front of them, and give a great perspective. On the second stage, I would just simply ask a general idea of "motivation." You have to give people a motive to travel on a path. 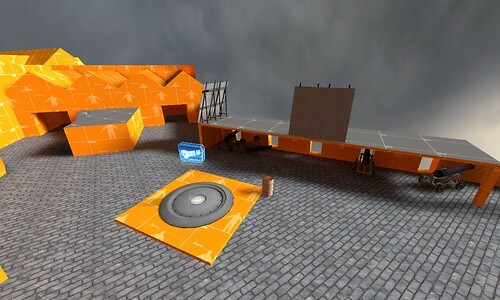 Think about a great idea of a map like CTF-Quarry. No one took the tunnels because they got randomly ran over, and there was no advantage to it. You have to give people an advantage or reason to take a path. You need to solve that problem, so just something to think about. I have the feeling that not many people will want to take the longer route when the shorter will do. I counted the steps it takes to get from spawn to the armoury point, and it's like 8 steps to go up the ramp and down again. And it's a direct route at that. In Dustbowl 2, you at least have to find a way to get up stairs or rocket jump up. What if you made the point in the armory itself, and then allowed for an "upper" armory for sentries, etc with metal? But you should allow for a block to where the sentries cannot get both the people coming in directly, and those getting around the back way. ANd last thing, do you want people to be able to use the standard cannon's for cover? In that case, you should put them a little higher. Really looking forward to your next alpha. I like this map, and it was nice that we had a good size group playing yesterday. Too bad neither team could push through to the 2nd or 3rd round, heh. That being said, 1 thing I noticed and 1 suggestion. When CP1 is being captured, it says "Our last cp is being captured." I've heard that the way to fix that is just change the warn field on the cp. What if there was another nook or two along the right hand wall as the attackers move from 1 to 2? You have one towards the top, but I'm thinking that if you had a but more of a defendable area there, O might have a better success rate. Yeah, just set the Warn on Capture field to "No". Kind of counter intuitive. I hope as far as style, you don't get to "fairy castle" with it like in the "Castle" map, and do it like the castle in Edinburgh which I have been to. Strong. Old. Tough. Stone. Also, are all of your cap points going to be "open" in this way? ... Snipers should be able to snipe, but there ha to be interference when someone gets you a half-a-mile away. Very good point. I'll look at putting in some appropriate cover in alpha4. I'm not sure whether you're talking about CP4 (very close to defending spawn--which has third exit away from the CP), or CP2 (further from defending spawn but no third exit). In my experience so far, I've not found spawn camping an issue at CP2 at all (it's hard for the defenders even to get near the point often), but it might perhaps at CP4. But I think that its proximity to the point helps the defenders more than it hinders. Yes, I noticed some metal shortages (and people have also been complaining about health shortages), so I will look into that for the next alpha. In Level 1, the sniper tower is a little ridiculous. Someone can snipe all the way to spawn from there, and there is no way to go and clean that room out. I love the drop down hole in the middle, but I would suggest you make it a perch instead of two small windows. You have to allow the sniper to be honest. At least if you had it open, or open with a guard in the middle it would make it more honest. You can clear the room out quite effectively now in alpha3 with the side stair. I considered the size of the windows very carefully -- they're large enough to shoot rockets/grenades into, but small enough that they seriously limit the snipers' field of view. So the snipers are defended well, but largely ineffectual. You can reach the point with a one sticky jump. I know you want to have the point visible from spawn as a visual cue, and there's no reason to put up and invisible wall, but it shouldn't be so easy to one sticky to the point right out of spawn. Yes, and one L1 sentry on the point will pick you out of the air as you go and kill you before you land. The first point is intentionally accessible to rocket/sticky jumps. In fact, the first point is meant to be relatively easy to take (but by no means impossible to defend); the attacking team needs to be able to get up momentum. My original concept did have the drawbridge as the door, and another door on the right-hand passage (the left-hand ramps onto the battlements weren't there then); but I couldn't solve the problem of attackers being able to rocket/stickyjump over the wall during setup time, without having a big, nonobvious invisible wall that disappeared after the setup was over. At the moment I have a similar problem with the assault to CP5, but it is easier to solve. I will be changing the first round spawn for the attackers, but they probably won't be able to reach the moat until after setup is over. So far I've found that the advantage of coming at the point from two sides has been enough motivation for players to take the long route to CP3. on CP4 the back route is unfortunately longer yet, though still considerably shorter than it was in earlier alphas. I may adjust the position of the red spawn to equalise things a little though. That being said, 1 thing I noticed and 1 suggestion. When CP1 is being captured, it says "Our last cp is being captured." I've heard that the way to fix that is just change the warn field on the cp. Thanks. I was told that on alpha2 as well, but forgot to fix it. It'll be fixed for alpha4. I'm considering a different approach to solving the problem actually, but we'll see how it plays. Another nook on the right-hand wall probably wouldn't hurt though. New spawn for the attackers in stage 1: Apart from being much more interesting visually, it should prevent spawn camping that was occurring with the earlier design. Side passage between CP1 and CP2: A nice spot the attackers to build a forward base when assaulting CP 2. 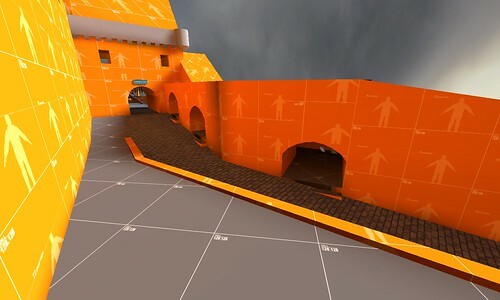 New platform at CP 2: Apart from visual interest, the attackers can easily get onto this platform once through the archway, and can better assault CP 2 from here. 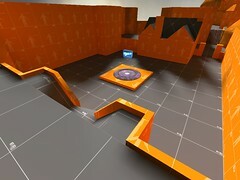 New spawnroom and setup area in stage 2: The attackers in stage 2 now use the blu spawnroom from stage 1. 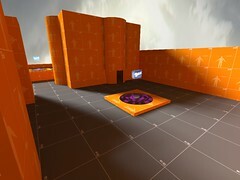 There are setup gates where the old spawnroom was, and to the right of this picture. Should make both paths equally distant, and thus more equally travelled. Oh, and health and ammo boxes more available now; should placate some players. Looks very good Velvet. I look forward to playing it on a full server. You'll be putting it up next time there is a gameday, yes? Yes, it'll go up for the next gameday. 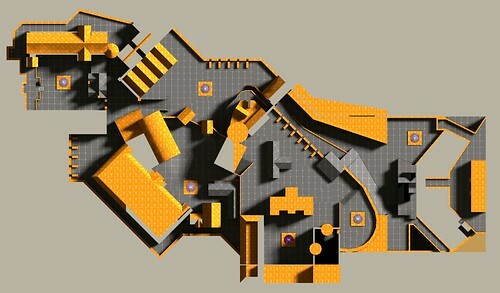 Also, I'll be posting all futher info about this map on my developer blog, as it works better for WIP and commenting. I'd like to express that your map looks great! And reading trough the whole testing/tweaking is a big help. Keep up the good work, can't wait to see it released!